Andover, MA – Royal Philips Electronics (NYSE: PHG, AEX: PHIA) today announced that it has received 510(k) clearance from the US Food and Drug Administration (FDA) to market its innovative EchoNavigator live image-guidance tool (EchoNavigator). 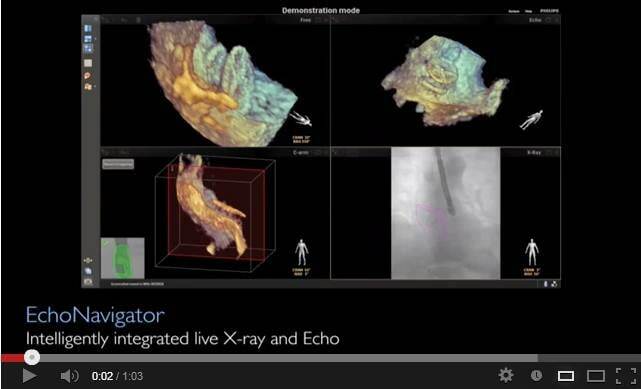 This world-first technology helps interventional cardiologists and cardiac surgeons to perform minimally-invasive structural heart disease repairs by providing an intelligently integrated view of live X-ray and 3D ultrasound images. Following the CE marking of EchoNavigator in Europe, Philips will now be able to introduce the system globally1. The first systems have already been installed in Europe and the US. Philips’ EchoNavigator has been developed in response to a clear upward trend in the use of both X-ray imaging and 3D cardiac ultrasound imaging (also known as echocardiography, or echo for short) during structural heart disease procedures - an area of interventional cardiology that is growing at around 40% per year. 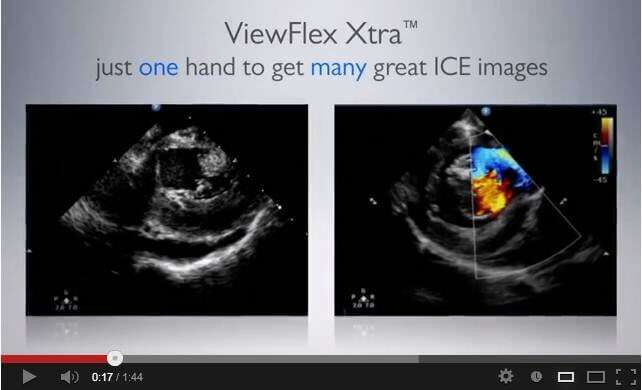 During such procedures, ultrasound imaging provides critical insights into the heart’s soft tissue anatomy, while X-ray imaging has particular strengths in visualizing the catheters and the heart implants. 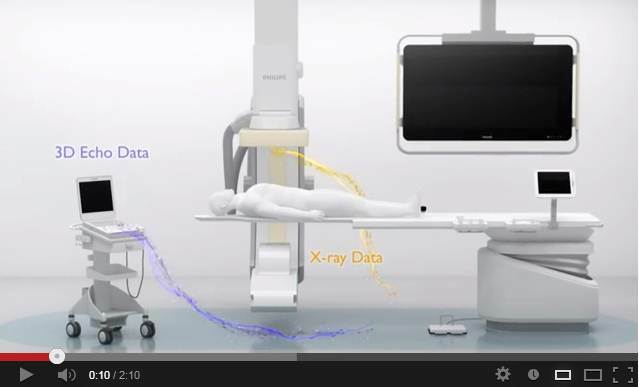 Working in collaboration with partner hospitals in Europe and the US, Philips designed EchoNavigator to address the unique challenges associated with working with live X-ray and 3D ultrasound images simultaneously. Accurately recognizing the heart structures from these medical images takes years of training and experience, and the use and interpretation of both imaging techniques during the procedures can be challenging, especially when manipulating and steering the catheters that carry the implants. Moreover, the communication during the critical moment of the procedure between the interventional cardiologist or surgeon steering the catheters, and the echocardiographer operating the 3D ultrasound equipment, has been identified as particularly demanding. 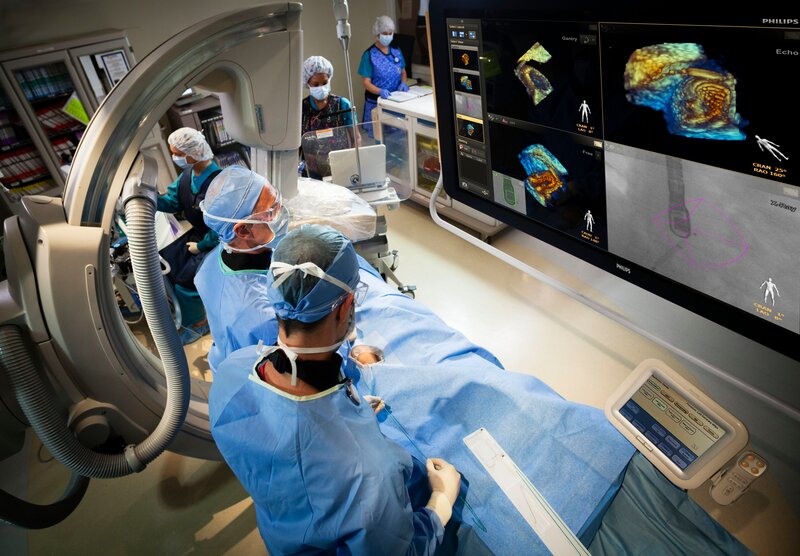 "Together with Philips, we set out to bring two separate medical imaging techniques together in a way that provides clear visual guidance," said Professor John Carroll, MD, Interventional Cardiologist, University of Colorado Hospital, Denver, US. "A world-first, EchoNavigator is enabling us to use X-ray images combined with real-time 3D ultrasound images to navigate catheters and deploy implants in the right position in the heart, making such treatments more straightforward." Philips’ EchoNavigator will enable clinicians to perform procedures more efficiently by providing intelligently integrated X-ray and 3D ultrasound images into one intuitive and interactive view, as well as providing easy-to-use system navigation and better communication between the multidisciplinary team carrying out the procedure. As a result, EchoNavigator helps save valuable time and enhances patient care. “As the global market leader in interventional cardiology, we have worked with our partners to lead the way with pioneering solutions such as our real-time 3D ultrasound technology and more recently our HeartNavigator navigation tool," said Gene Saragnese, CEO for Imaging Systems at Philips Healthcare. "EchoNavigator is further evidence of our commitment to transforming healthcare through the introduction of innovations that enable best in class minimally-invasive procedures." Philips offers a comprehensive interventional cardiology portfolio that includes hybrid operating room solutions and imaging solutions plus advanced interventional tools that work smoothly in sync with them. In 2011, Philips introduced HeartNavigator, a procedure planning and image guidance tool optimized for minimally invasive aortic heart valve replacements. Philips’ new EchoNavigator unites the company’s strengths in interventional X-ray and ultrasound, as well as its strengths in clinical information solutions. Philips introduced Live 3D Trans Esophageal Echo (Live 3D TEE) technology2 as an industry-first in 2007 on its iE33 ultrasound system and last year introduced CX50 xMATRIX - the world’s first compact portable ultrasound system to incorporate Live 3D TEE technology3. “In the emerging field of complex structural heart disease interventions, the information obtained by merging imaging technologies, as now possible with HeartNavigator and EchoNavigator, will be of tremendous value to the interventionalist, and in turn to the patient,” said Dr. Carlos Ruiz, MD, Director of the Structural and Congenital Heart Disease program, Department of Interventional Cardiology at Lenox Hill Hospital, New York (US). Philips’ EchoNavigator will be on display at the American College of Cardiology’s 62nd Annual Scientific Session & Expo (ACC.13), March 9-11 in San Francisco, California, US. Visit Philips at ACC.13 at booth #S1009. 1Not available for sale in Brazil, Saudi Arabia, Serbia, and Australia pending clearance by the relevant regulatory authorities. 2With this technology an ultrasound scan is taken by placing a special 3D ultrasound transducer into the patient’s esophagus so that it is positioned close to the heart valves. 3Both iE33 xMATRIX and CX50 xMATRIX support EchoNavigator.